Make some figures by drawing lines so that each figure goes through just one clue. All the cells will be visited by lines. Each clue shows how the lines of the figure upon it turns or connects without any rotation or reflection. (The clues do NOT inply lengths of any part of the line) Different figures do not share same cell. ※English rules are from No Numbers. Thanks xevs! Curvedata is the puzzle invented in 2002 by Tatsuya Yamamoto, whom some people may know as WPC competitor. Originally, there were one more restriction in the puzzle. Every shape cannot occupy 2x2 cells. In 2011, Naoki Inaba proposed to remove its restriction. You can find his puzzle here(see 5-8)(*3). This puzzle uses Chinese character as a shape. So it may seem to be complicated for foreign puzzlers. Now there are few puzzles in this genre. Ko Okamoto(xevs) made some new puzzles for his own competition. And Prasanna Seshadri from India made for its practice. I expect further development of the genre future. (6/15 update) There are two puzzles in Puzzle Graffiti. (*1) 山本達也, インターネット激作塾, カーブデータ, 2002/11. 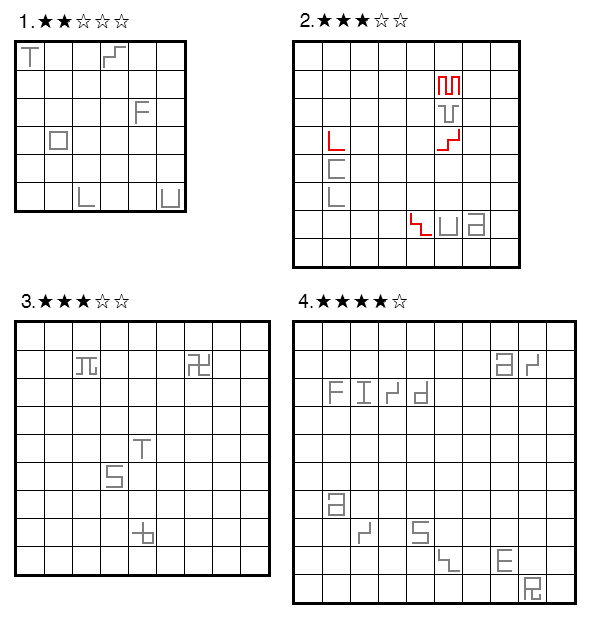 (*3) These puzzles were made for small offline competition held at Tokyo last year. It is named JZC(Japan Zukei-Geometric- Puzzle Championship). 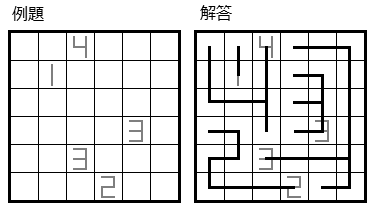 As everything are Japanese in these puzzles, I'm planning to translate them for foreign puzzlers. Thanks for the fun puzzles. I certainly hope your prediction about the type holds, because it's the first type in quite some time that instantly captured my interest. The example being a Nurikabe chimera is a nice touch too.